I'm struggling to understand exactly how einsum works. I've looked at the documentation and a few examples, but it's not seeming to stick. I think this would take A^T * B, but I'm not sure (it's taking the transpose of one of them right?). Can anyone walk me through exactly what's happening here (and in general when using einsum)? transpose the axes of the new array in a particular order. 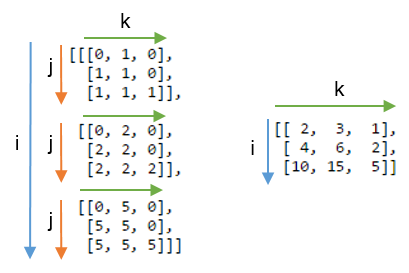 There's a good chance that einsum will help us do this faster and more memory-efficiently that combinations of the NumPy functions like multiply, sum and transpose will allow. So here, the indexing operation on A lines up the first axes of the two arrays so that the multiplication can be broadcast. The rows of the array of products is then summed to return the answer. The signature string 'i,ij->i' is the key here and needs a little bit of explaining. You can think of it in two halves. On the left-hand side (left of the ->) we've labelled the two input arrays. To the right of ->, we've labelled the array we want to end up with. A has one axis; we've labelled it i. And B has two axes; we've labelled axis 0 as i and axis 1 as j. By repeating the label i in both input arrays, we are telling einsum that these two axes should be multiplied together. In other words, we're multiplying array A with each column of array B, just like A[:, np.newaxis] * B does. Notice that j does not appear as a label in our desired output; we've just used i (we want to end up with a 1D array). By omitting the label, we're telling einsum to sum along this axis. In other words, we're summing the rows of the products, just like .sum(axis=1) does. That's basically all you need to know to use einsum. It helps to play about a little; if we leave both labels in the output, 'i,ij->ij', we get back a 2D array of products (same as A[:, np.newaxis] * B). If we say no output labels, 'i,ij->, we get back a single number (same as doing (A[:, np.newaxis] * B).sum()). The great thing about einsum however, is that is does not build a temporary array of products first; it just sums the products as it goes. This can lead to big savings in memory use. You can see that label j is repeated - this means we're multiplying the rows of A with the columns of B. Furthermore, the label j is not included in the output - we're summing these products. Labels i and k are kept for the output, so we get back a 2D array. Summing axis j gives the expected dot product, shown on the right. To get more of feel for einsum, it can be useful to implement familiar NumPy array operations using the subscript notation. Anything that involves combinations of multiplying and summing axes can be written using einsum. Let A and B be two 1D arrays with the same length. For example, A = np.arange(10) and B = np.arange(5, 15). Grasping the idea of numpy.einsum() is very easy if you understand it intuitively. As an example, let's start with a simple description involving matrix multiplication. To use numpy.einsum(), all you have to do is to pass the so-called subscripts string as an argument, followed by your input arrays. Here are some more examples illustrating the use/power of np.einsum() in implementing some common tensor or nd-array operations, succinctly. Such a multiplication could be very useful when solving linear system of equations (Ax = b) where you want to verify the result. Your calculation, takes a 'dot' (sum of products) of a (2,3) with a (3,4) to produce a (4,2) array. i is the 1st dim of A, the last of C; k the last of B, 1st of C. j is 'consumed' by the summation. This is the same as np.dot(A,B).T - it's the final output that's transposed. That is, add a k dimension to the end of A, and an i to the front of B, resulting in a (2,3,4) array. We use -> to indicate the order of the output array. So think of 'ij, i->j' as having left hand side (LHS) and right hand side (RHS). Any repetition of labels on the LHS computes the product element wise and then sums over. By changing the label on the RHS (output) side, we can define the axis in which we want to proceed with respect to the input array, i.e. summation along axis 0, 1 and so on. Notice there are three axes, i, j, k, and that j is repeated (on the left-hand-side). i,j represent rows and columns for a. j,k for b. Finally, the indices are (alphabetically) reversed on the right-hand-side so we transpose. Not the answer you're looking for? Browse other questions tagged python arrays numpy multidimensional-array numpy-einsum or ask your own question. Matrix multiplication of inner dimensions of 3D tensors? Is std::vector so much slower than plain arrays?